Slime Algae, also known as blue-green algae or smear algae, is usually blue-green in color, but it may also be brown or black. It looks and feels exceptionally slimy, and, when disturbed, it comes off in sheets. Slime algae grows quickly and covers the aquarium surface, often giving off an unpleasant swampy or fishy odor. Slime algae, aka blue-green algae, is actually the organism cyanobacteria. It comprises (usually) single-celled bacteria that often grow in colonies large enough to see, forming filaments, sheets, or spheres. They are aquatic and photosynthetic, that is, they commonly live in fresh or salt water and can manufacture their own food. Cyanobacteria contain a chlorophyll not found in other bacteria, endowing them with their blue-green color, and they produce oxygen as a by-product of photosynthesis. This large, important group of bacteria has been around for more than 3.5 billion years. Before you condemn the slimy stuff you have to clean up, smile and think of what the creatures have contributed to life on earth. First, the oxygen atmosphere that we depend on was generated by numerous oxygen-producing cyanobacteria during the Archaean and Proterozoic eras. Before that time, the atmosphere had a very different chemistry, unsuitable for life as we know it today, according to the University of California Museum of Paleontology (UCMP). Second, says UCMP, this bacteria is responsible for the origin of plants. The cyanobacterium living within plant cells is what enables plants to make food for themselves. "Sometime in the late Proterozoic, or in the early Cambrian, cyanobacteria began to take up residence within certain eukaryote cells, making food for the eukaryote host (organisms with a nuclear membrane and chromosomes, like plants) in return for a home," as UCMP puts it. With a history like this, it's easy to see how well cyanobacteria learned to survive. For you and your aquarium, it means slime algae is persistent and difficult to eradicate. Overgrowth of cyanobacteria in your aquarium generally occurs when there are high levels of dissolved organic wastes and nutrients in the water. This may be due to lack of water changes and regular maintenance or overfeeding, or it may be because the tank is new and the beneficial bacterial colonies have not become established. That said, because cyanobacteria can produce fix nitrogen, it can appear even in a well-maintained, matured tank. How Do You Get Rid of Slime Algae? 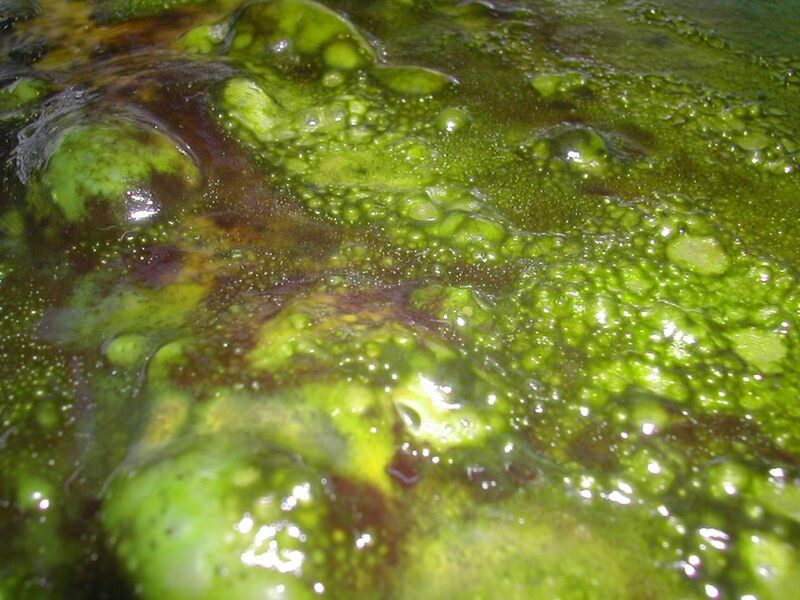 Physically remove and clean tank well: Once established, blue-green algae is difficult to eradicate. It can be removed initially by scraping the glass, scrubbing gravel and plants and vacuuming the substrate. However, the algae will soon return, especially if the underlying causes are not corrected. Partial water change: Regular ongoing water changes and maintenance will delay and sometimes eliminate reoccurrence. Treatment with erythromycin: Adding erythromycin phosphate at 200 milligrams per 10 gallons of water will eliminate the bacteria causing the slime. However, use of erythromycin can also affect the beneficial bacteria in the aquarium and should be used with care. If such treatment is used, monitor ammonia and nitrite levels closely for several weeks. Algae eaters do not help: If you were thinking of adding algae eaters, note that algae-eating fish do not eat cyanobacteria. How Do You Prevent Slime Algae? As with any algae, keeping the tank clean and performing regular water changes are among the best preventative measures. Avoid overfeeding fish, which will help you control the excessive dissolved organic wastes and nutrients in the water that fuel algae growth. Unfortunately, it is still possible to get algae in spite of regular maintenance and best practices. Small amounts of algae are normal, but you are trying to avoid those stinky, slimy sheets. You may be able to if you react quickly whenever you see them begin to form again. Prompt attention to sudden algae growth will usually prevent more serious problems.